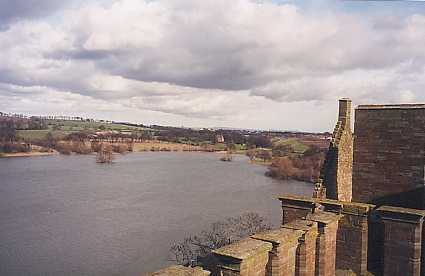 Linlithgow Palace is perhaps best known as the birthplace of Mary Queen of Scots. As it turned out, the infant queen remained only seven months at Linlithgow before being taken by her mother to the greater security of Stirling Castle. It was another 20 years before she returned. 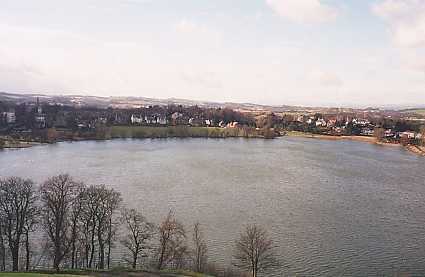 Linlithgow lies roughly midway between Edinburgh and Stirling. The ruins of the palace stand beside St Michael's parish church (right) on a natural hillock, which overlooks the town to the south and extends as a promontory into Linlithgow loch on the north (below). A royal manor house probably existed on this site from the mid-twelfth century, when Kind David I founded the burgh. 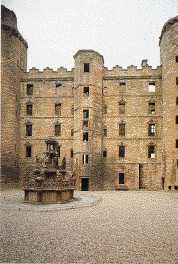 Linlithgow's position made it an ideal site for a military base, and in 1302 the English king set about transforming it into a secure stronghold built mostly of earth and wood. The promontory was cut off from the town by a deep ditch, behind which was erected a "pele" or stockade, made of split tree trunks. After the battle of Bannockburn in 1314, the castle returned to Scottish hands. Nothing remains today of the early manor house except the name, the "Peel" which today applies to the whole of the Royal Park surrounding the palace. In 1424, a disastrous fire destroyed most of the town of Linlithgow as well as the parish church and the royal manor house. King James I (below right), who had only recently returned from exile in England, set in train almost at once a programme of building work, which, little more than a century later, came to completion in the royal palace much as we see it today. Work was concentrated on what is now the east range, including the great hall, and the adjacent parts of the north and south ranges. The palace would thus have had a C-shaped plan, probably open on the west. 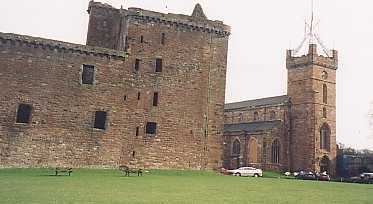 The grandiose gateway (below left) in the centre of the palace's east wall still survives, though the ramp and drawbridge before it have long since gone. The principal room of the new palace was the great hall. This ranks as one of the finest medieval interiors in Scotland, though in its present form it dates largely from the reign of James IV. Some further repairs and alterations were made under the reigns of James II and James III between 1437 and 1488 but it was not until James IV (Mary's grand-father) came to the throne that any significant changes occurred. The most significant element in the new work was the completion of the new west range, closing off what had formerly been the open side of James I's palace. This new range contained suites of royal apartments for the king and queen. The great hall was remodelled, the kitchens, brew house, larders and pantry renovated and works were also carried out to the north range. The south-east corner was completely rebuilt above ground-floor level. Immediately west of this, a new chapel was constructed where at first-floor level where some of the royal apartments had probably been before. A three-tiered enclosed gallery was built on the north side of the south range overlooking the central court (below), to link the great hall with the new west range. The peculiarly English style of this façade is perhaps the result of English masons working on the palace, following the king's marriage in 1503 to Margaret Tudor, the daughter of King Henry VII of England. On 9 September 1513, the peace with England having foundered, James IV faced the Earl of Surrey's army on Flodden Field, where he fell along with many of the Scottish nobility. Queen Margaret is reputed to have waited vainly for his return from the battle in the draughty look-out post above the north-west turnpike stair, known today as "Queen Margaret's bower". In 1514 she married Archibald Douglas, sixth earl of Angus, and fled Scotland with him. Margaret had given birth to a son on 10 April 1512 who succeeded his father as James V (Mary's father). 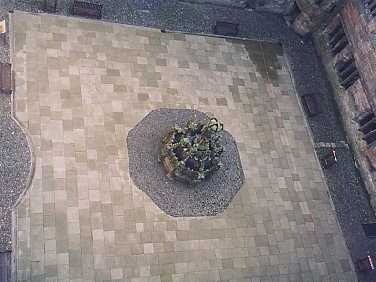 Work began again in 1534. The main entrance to the palace, inconveniently situated on the east side, was moved to the south, and an outer gateway was built south of it, giving access to the outer enclosure from the town. The proportions of the south front were also improved by straightening out the south wall and enlarging the south-west tower to balance the one on the south-east. In the chapel a new wooden ceiling and canopied altarpiece were inserted, the interior was painted and the windows re-glazed with painted images. The great hall was refurnished and given new windows; alterations were made to the kitchens and the external sculptures were painted. 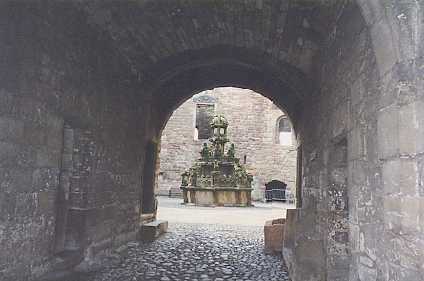 The fountain in the centre of the court (above) was built around 1538; and in 1540 there is reference to a catchpull, or tennis court, similar to the one still surviving at Falkland Palace. Mary of Guise-Lorraine (Mary's mother) whom he married in 1537, is reported to have compared Linlithgow Palace to the noblest châteaux in France. After the death of James V and the birth of Mary Queen of Scots, various small expenditures were made on the palace during the regency of Mary of Guise. The palace and its surrounding park and garden appear to have been kept in reasonable repair during the years of Mary's brief personal rule when she occasionally resided there. Various important prisoners were warded in the palace at this time, including, in 1579, the insane third earl of Arran and his mother. However, by the time Mary's son, James VI was old enough to assume control of the government in 1585, the years of neglect at Linlithgow were beginning to seriously affect the stability of the palace. It was to be another 11 years before the king's officers began to repair the damage. 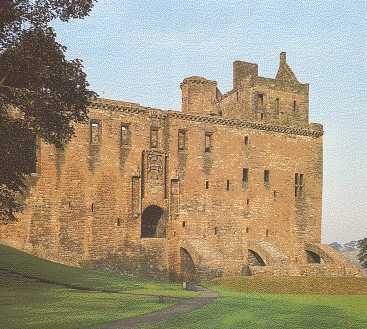 The north range (above left) was finally rebuilt and represents, even in its present ruined state, one of the finest Renaissance façades in Scotland. In 1603, on the death of Queen Elizabeth I of England, the court moved to London. The new palace buildings at Linlithgow, built after the Union of the Crowns of Scotland and England, were evidently intended to provide fitting accommodation for the enlarged court that would have accompanied the king when he returned to visit his native land. 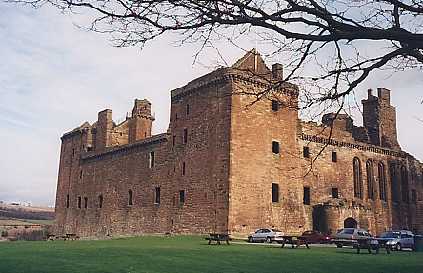 However, James did not visit Linlithgow when he returned to Scotland in 1617. When his son Charles I took over in 1625, several repairs were carried out in preparation for his visit. 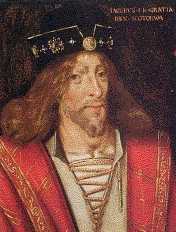 Following his execution in 1649, the Scots proclaimed his son as Charles II, and Oliver Cromwell invaded the country. He defeated the Scots army at Dunbar in September 1650 and spent the winter at Linlithgow. Charles II was restored and ordered in January 1663 to have the English defenses levelled. 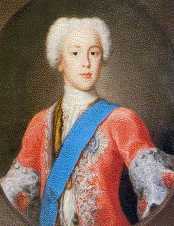 His brother, James VII was removed from the throne during the "Glorious Revolution" in 1688-89. In 1745, Prince Charles Edward Stuart, the Young Pretender (Bonnie Prince Charlie) above right), was the last of that house to stay in the building. In January 1746 troops of the duke of Cumberland's army marched out of the palace leaving fires burning which soon caught hold of the building and burnt it out. Since 1746, the palace has remained unroofed and uninhabited. In 1906 the fireplace in the great hall was restored and a programme of clearance and consolidation was carried through over the next three decades. Today the palace is cared for and on behalf of the Secretary of State for Scotland by Historic Buildings and Monuments. The peel is administered as one of the Royal Parks, and for this reason, like the park of Holyroodhouse, it has its own police force.